Recent research by Springbuk that includes a survey of over 500 employers gives insight to wearable tech in the enterprise. Released this year, Springbuk’s Employer Guide to Wearables includes a comprehensive review of 24 devices, explains what employers look for in wearables and includes a device checklist for employers interested in purchasing these for use in their organization. Smart watches and other wearable tech easily measures human movement, hence why they’re so popular! As wearable tech becomes increasingly accessible and commonplace in the workplace, employers are looking for innovative ways to use devices in their wellness programs. As more information is is collected, employers face the problem of big data, that is, making sense of it all. Despite the ability of wearables to collect a multitude of metrics including: steps, sleep duration and quality, heart rate and more, many employers are not utilizing this data at all. According to the report, “Eighty percent of employers are either “interested” or are in the process of buying wearables for their wellness program. However, most respondents indicated that the devices would be used to track the most basic metric in wellness: participation.” Analytic tools, methods of interpreting device data, are key to connecting the dots between activity and outcomes. Springbuk finds the following outcomes important to employers: improving employee health, driving behavior change and engaging “at risk” members. A trend towards an increasing role of wearable tech in wellness program strategy is apparent. However, some wearable features are more desirable to employers than others. Specifically, respondents rated “app usability”, “step counting” and “long battery life” as the top three features. “Alarms”, “GPS” and “sleep monitoring” ranked as relatively unimportant. When it comes to wearable tech, employers seek to maximize investments and obtain useful information that can ultimately be used to drive health outcomes and reduce overall costs. 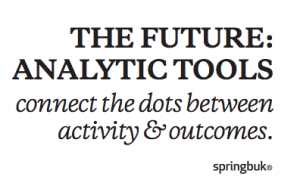 Analytics are required to translate collected data into meaningful and actionable insight — we can help. Read more from Springbuk here.